Author and lecturer Fouad Masri was born and raised in the war zone of Beirut, Lebanon. As a third generation ordained pastor, he has a passion for sharing the love of Christ with Muslims and has been reaching out to Muslims and inspiring others to follow his example since 1979. Fouad has trained more than 21,000 Christians to sensitively and purposefully share their faith with Muslims through both the Bridges One-Day and Sahara Challenge training experiences. He has served as a guest instructor at several universities and Christian ministries and has been featured in several media publications including Christianity Today, Newsweek, and Mission Network News. He has appeared on CBN, TBN, the Janet Parshall Show, and Prime Time America. Mike Kuhn married Stephanie in 1983 and for the next twenty-two years lived in Europe, North Africa, and the Middle East. As he befriended his Muslim neighbors, what he learned experiencing day-to-day life was more than any book or university could have ever taught him about engaging the Muslim world. He grew to love not only Muslims, but also the Arabic language and now teaches it at the college level. 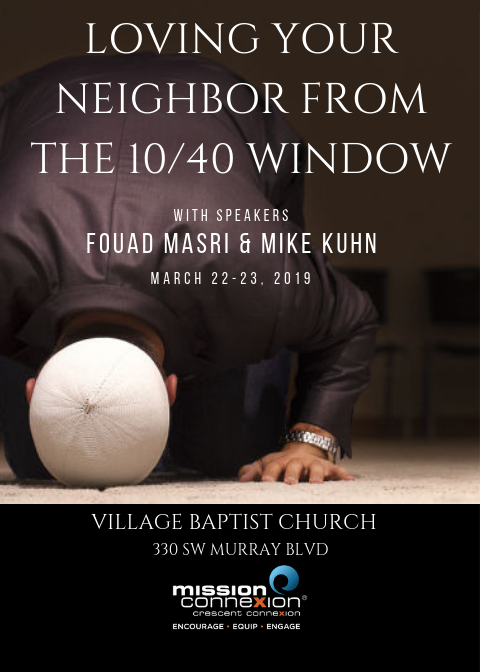 Mike’s ongoing friendship with believers from an Islamic background continues to influence his understanding of God’s pursuit to reconcile all nations to himself. He’s most resent book is Fresh Vision for the Muslim World.